Published by Joshua Clare-Flagg on 13 Dec, 2013. When I first received the Christopher Ward C1000 Typhoon, I naturally showed my wife and asked her opinion. “It’s a bit G.I Joe, isn’t it?” Was her response. “Yes, yes it is.” I thought to myself. “And that’s why I love it”. There’s no chance in hell that I could pass off as an action man or pilot. I’m a web designer and watch geek. But with the C1000 on, I feel like I could be. 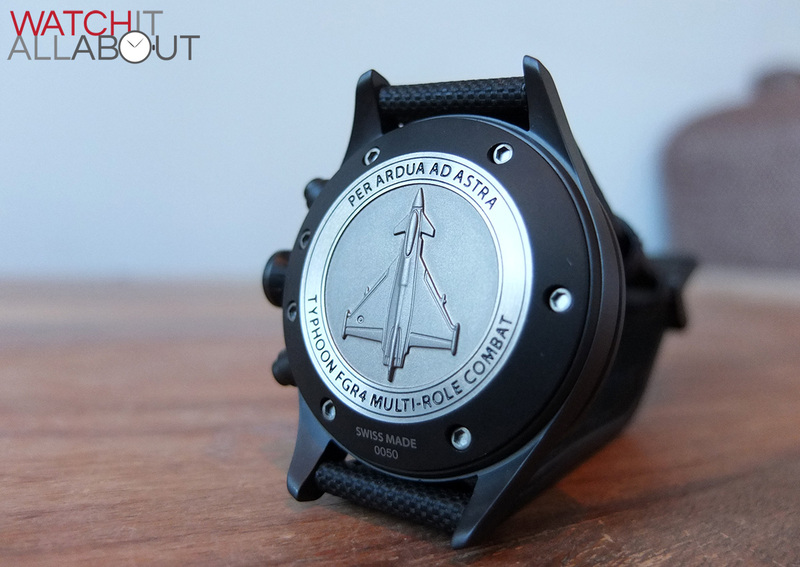 It certainly is a manly watch – large, black and extremely durable. Ready for anything you throw at it. Even if the most you’ll ever throw at it is a trip to the office and a hard days work of desk diving. 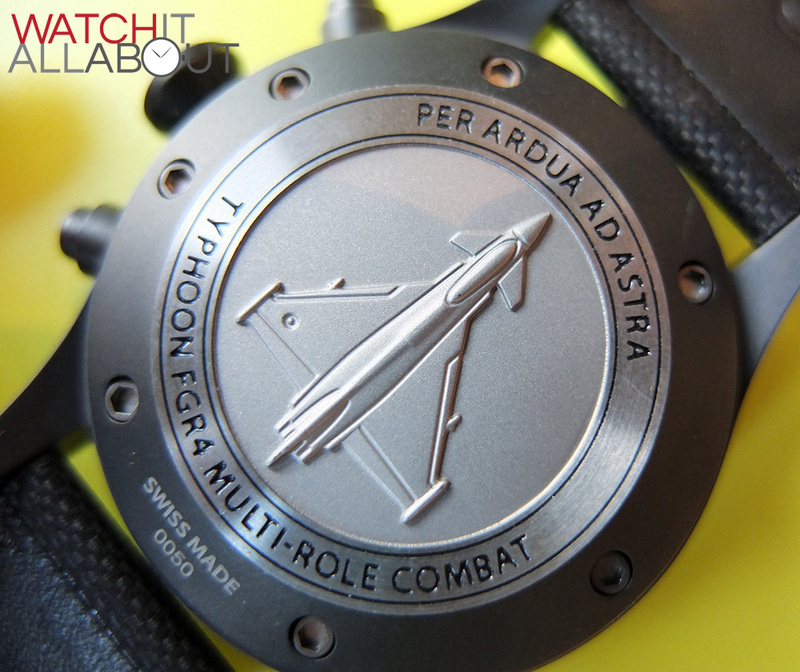 It doesn’t matter – you’ve got a fighter jet strapped to your wrist. Game on. 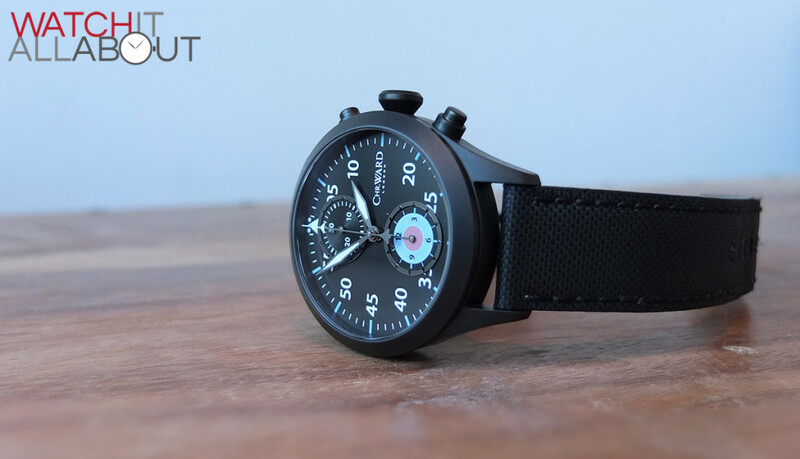 The C1000 is currently Christopher Wards most technically advanced watch, thanks to the fully ceramic case and titanium sub-frame, modified 7750 movement and impressive specs. It is also a super refined timepiece in the hand. You can tell that it’s that level higher than your standard Swiss Made watch. Which brings us onto the price. I know our cap is usually around £500-700, but I’m a self confessed Christopher Ward fanboy at Watch It All About, and it still offers a lot for the £1500 price tag. Any other watch offering the same specs would cost you double at least. So let’s have an in-depth look into the C1000 to see if it is good value for money at this price. 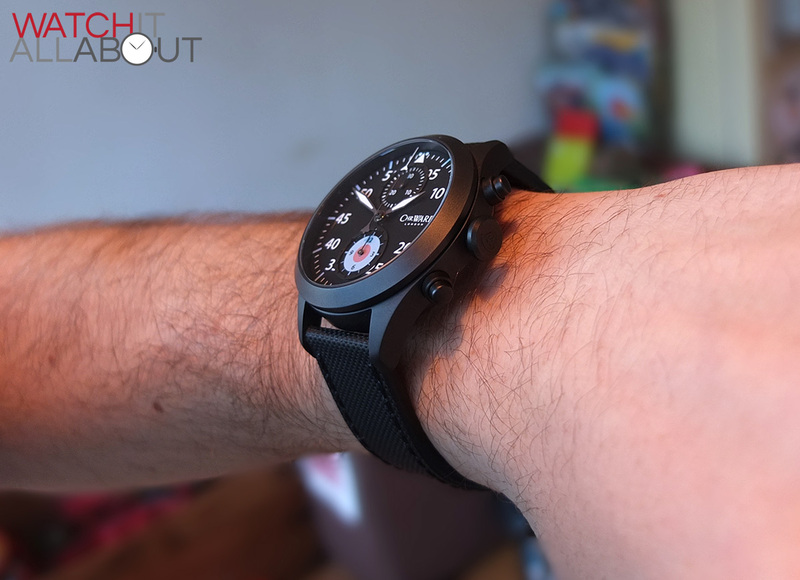 The case measures 42mm in diameter, so it is a reasonable size on the wrist, and gives great wrist presence, mainly due to the jet black finish of the whole watch bar the roundel. This is not a watch which will get away with not being seen! The main selling point and reason behind the higher than usual cost is the ceramic outer case. 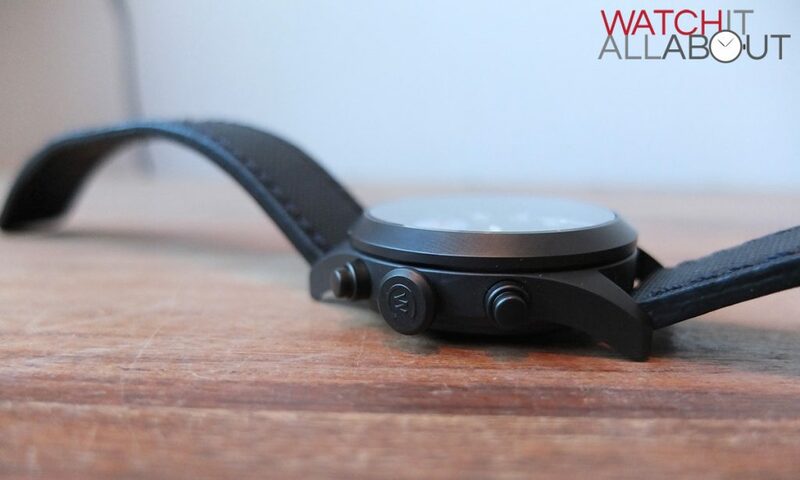 According to Christopher Ward, this material is seven times stronger than steel and is virtually indestructible. 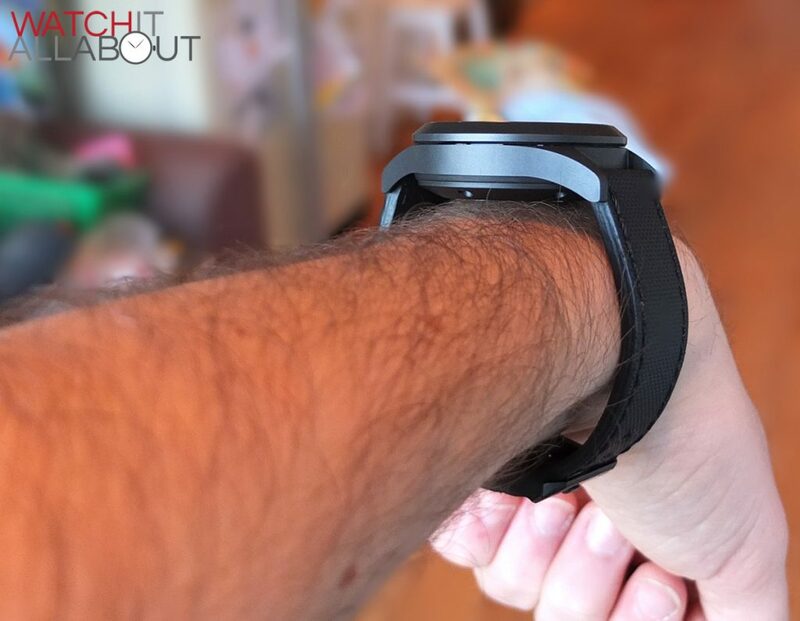 It is also incredibly resistant to any scratches (only a diamond can scratch it) or dents, so you will be happy to know that the watch you just dropped £1.5k on won’t damage easily. 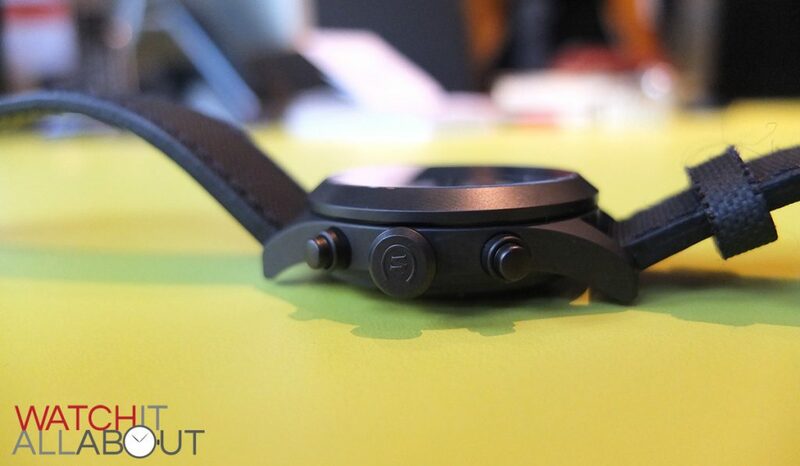 The colour of the ceramic case is a deep, dark matt black. It is also soft and not metallic to the touch, almost feeling as if it is a painted coating. The case is built around a titanium inner frame (another reason behind the price). This is usually made of steel. But in this case, steel just won’t cut it. Titanium is much stronger and lighter than steel giving the C1000 Typhoon incredible strength with minimal weight. Using my incredibly sophisticated kitchen scales, I measure the total weight (including the strap and buckle) to be around 110g. For a watch that houses the thick and heavy 7750 movement (which weights around 30g on it’s own), that really is incredibly light. 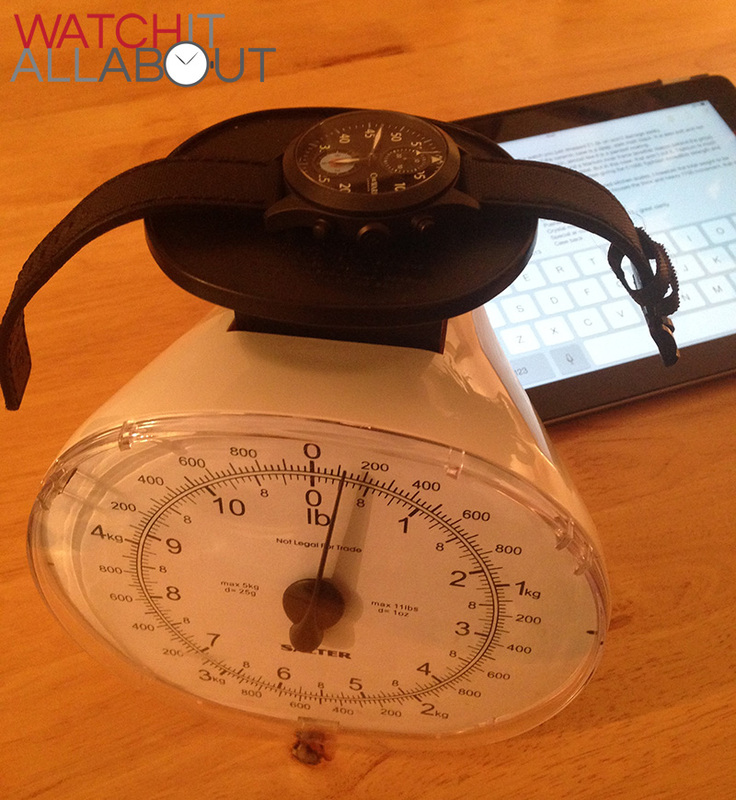 For comparison – a standard watch with a stainless steel bracelet would weigh in at around 220g at least – that’s double the weight. The crown is a classic onion crown that we see on so many aviation style watches. It is push/pull, not a screw-in. 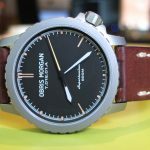 It is exceptionally well machined as you would expect, with a gentle top border radius, which means that you don’t get red marks on the back of your hand from it digging into it if you wear it on your left wrist. The CW logo is embossed on the end, subtly done, but with enough depth to notice it and realise it is good quality. The chronograph pushers are relatively simple, being cylindrical in shape, with a bordering surround around the bottom. Again, these are perfectly machined and fit to the case with extreme precision. The action of the pushers are quite firm, but that’s mostly due to the movement. When you click them you get a great sound and an instantaneous spring back on release. The crystal sitting atop the case is Christopher Ward’s museum grade as on the C11 – which is stunning and offers great clarity. This is coupled with a special anti-reflective coating, called “AR-08”, which is also museum grade. What this means, I’m not sure. But it is obvious that it is very good at it’s job. The crystal is so clear it’s hard to believe it’s there. The case back on the C1000 is one of the best I’ve seen on a Christopher Ward (bar the exhibition back on the monopusher). They have really gone to town with this one – the main feature is a Typhoon in the centre. It is extremely well machined and exceptionally deep too. The detail to the plane is incredible, with multiple layers evident and again, engraved with impressive accuracy. Surrounding the Typhoon is “per ardua ad astra” meaning “through adversity to the stars”. This is the RAF’s motto and is another link for this watch to aviation. Below this is the details of the Typhoon fighter jet, and right at the bottom we have “Swiss Made” and the serial number. Rather than being a screw-in case back, it is secured in place by 7 hex screws. As it only has a water rating of 50m, a screw-in case back is not necessary, and would be very difficult to make out of ceramic anyway. The hex screws look great, and make the case back look even more tool-like. The general shape of the case is quite plain, it being a simple cylinder with straight forward lugs protruding out either end. 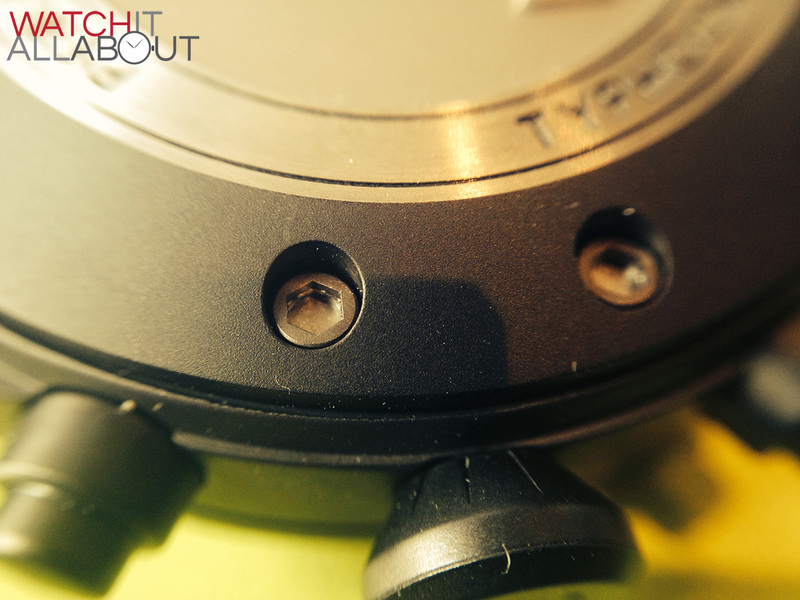 Below the bezel on the side is a small indent, which breaks up the case’s side profile. The lugs do have a reasonable down turn, offering a comfortable wear due to the way the case naturally follows the shape of the wrist. This coupled with the low weight results in a very comfortable and easy wear. Due to the 7750 movement, the case is quite tall, so sits reasonably high on the wrist. In general, the case is perfectly machined and finished, with a sense and feeling of beautiful refinement. 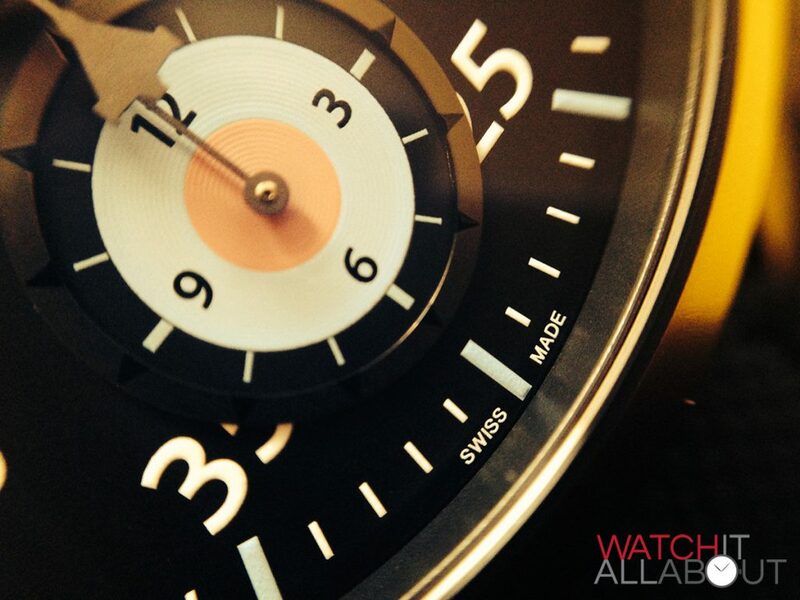 The dial is very simple, and is based on the usual classic Big Pilot aviation watch. 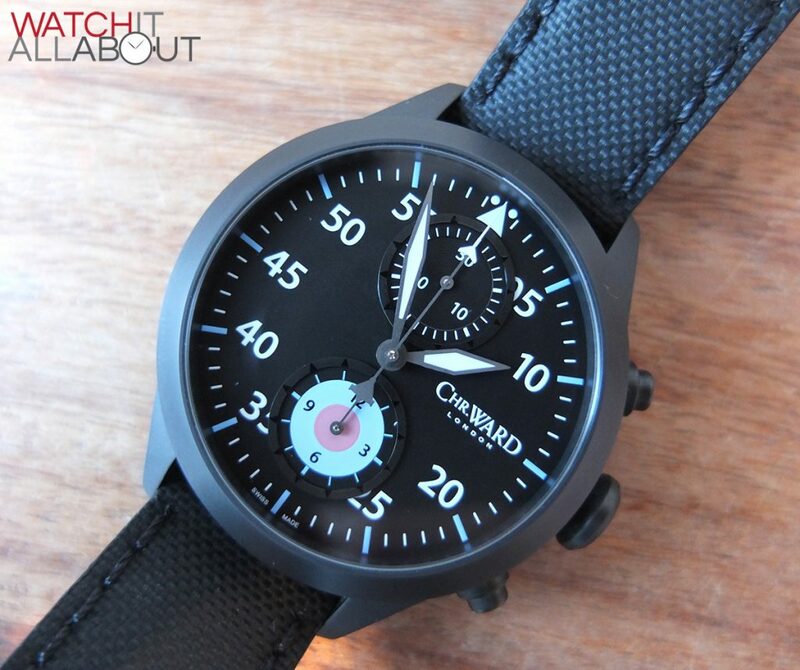 Christopher Ward have taken the inspiration of the Typhoon fighter jet seriously with the dial as we will discuss. There are a number of elements which are taken directly from different aspects of the jet itself. The colour of the dial is a very deep “charcoal” matt black, which matches the colour of the case spot on. Sometimes on some watches this is not matched too well and it can make a watch look unrefined. Not with the C1000 though. The subdials are well designed and thought through. 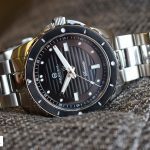 They both have a very slight concentric circular pattern on them, providing a small helping of texture to the dial – and the only helping at that. The top subdial is the 30 minute counter, and has very plain and understated markings – just a minute track with slightly thicker markings at 5 minute intervals, and 10, 20 and 30 minutes typed out. This does result in very high legibility thanks to it’s simplicity. 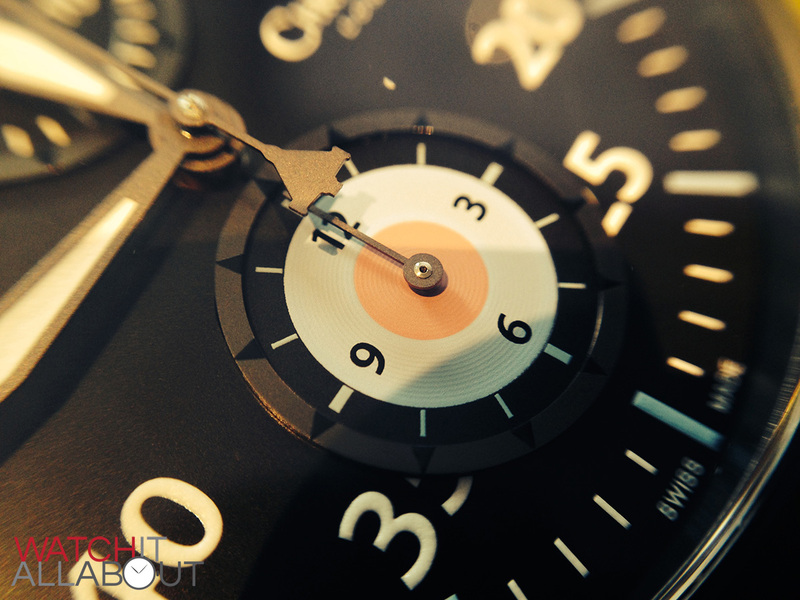 The bottom subdial is the 12 hour counter, and is a bit different. Within it is the RAF’s low visibility roundel of salmon pink and baby blue. Around the blue outer ring are hour intervals by means of matching blue batons protruding out of the roundel. Within the blue ring are the printed hour markers for 12, 3, 6 and 9. Again, very subtle design features which you may not notice, but offer practical and interesting functionality. For some, the roundel may put them off. 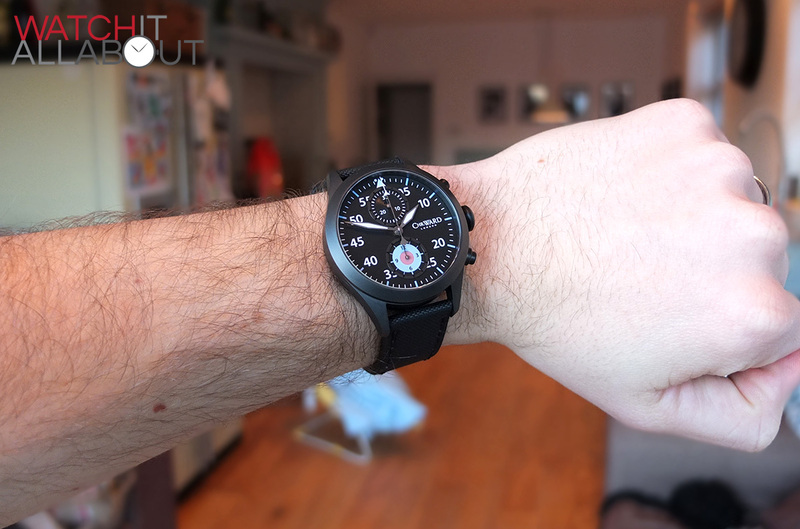 It does look quite brash, but when the watch is on it actually doesn’t draw too much focus. The colours are soft enough to not spoil the dial, but as is inevitable with a completely black watch, colourful enough to be a major feature. Which it is at the end of the day – this watch is a dedication to the Typhoon and the RAF after all. A very nice touch is the outer edging around the subdials, which appear to be made of titanium. These are designed to imitate the Typhoon’s after-burners, which is an inspired element. They look stunning, and very refined. They are subtle, you wouldn’t necessarily notice them at a glance. But look closer and they’re there, giving the dial a hint of depth, and if the light catches them right they look stunning. The hands are all quite simple, with legibility being their main focus as is the majority of the C1000. 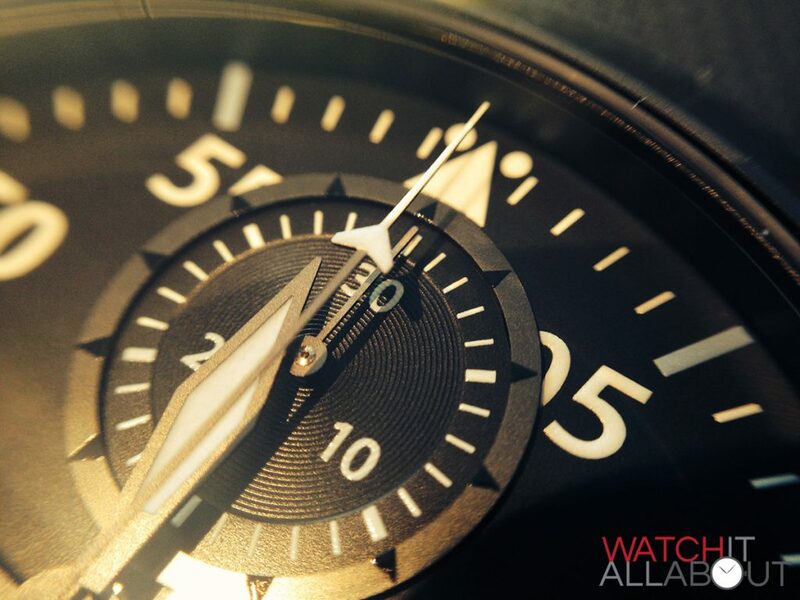 The hour and minute hands are classic Big Pilot / Aviator style, being a thin diamond shape. They have a smart looking matt titanium bordering to them which matches the subdial surrounds, and they have lumed centres. The big second hand is another aspect which is directly influenced by the Typhoon jet. The counter balance is based on the delta-wings, and the tip is the canards (the small forward wings). 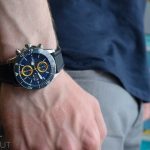 This hand is made of the same titanium material as the other big hands, and the tip is painted white, ensuring high visibility of the chronograph seconds. The subdials both have the same very simple stick hands, made of the same material as the others. Again, a very no-nonsense, simple design. All the hands are beautifully made, machined flawlessly and look extremely refined thanks to the different to usual dark gun-metal grey colour of the material. The simplicity of the dial is exaggerated by the fact that there is no date or running seconds at all. This will annoy some (especially the no date) but I believe it is for the better – omitting these results in a very clean, bold design. 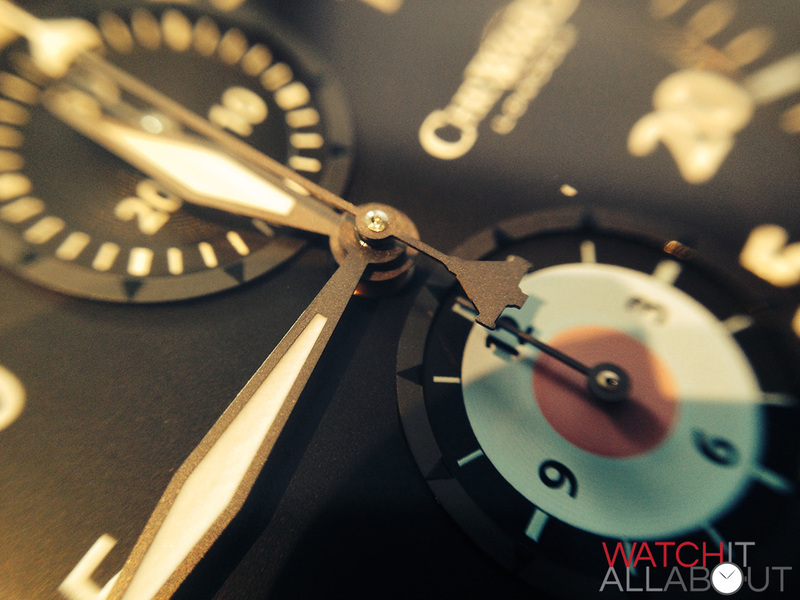 The lume on any Christopher Ward has yet to wow me, although the C1000 Typhoon is slightly stronger than usual. The hour markers and hour and minute hands are the only lumed sections, and whilst it is visible after a charge, it doesn’t glow that bright or last for a particularly long time. 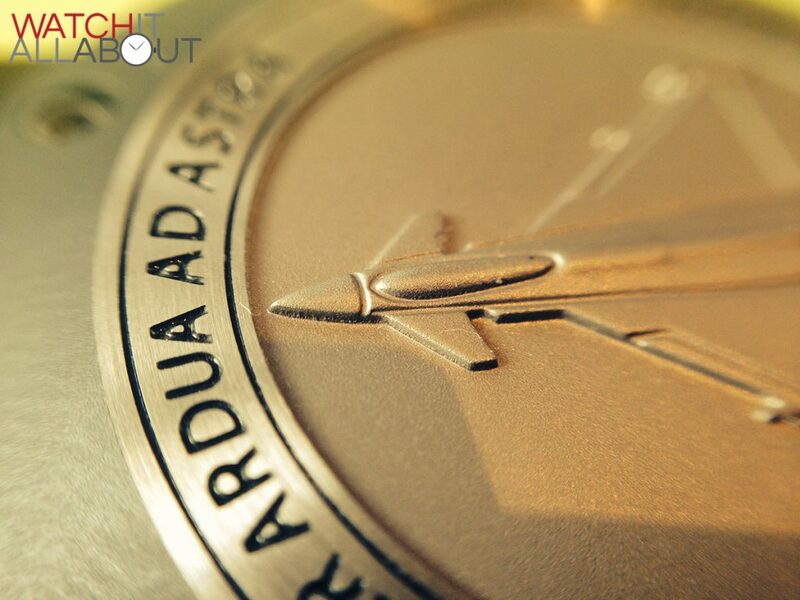 Another feature which is taken from the Typhoon jet is the font used for the hour markers. The font is taken from the Head Up Display (HUD), which is a display of certain information which is projected onto the screen. As you would expect, all printing is flawless and very minimal. Everything is very well executed. 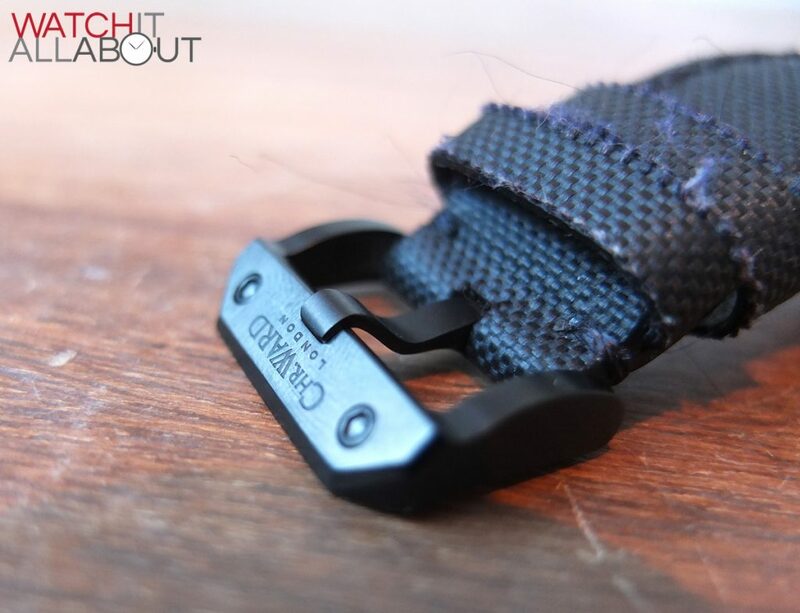 The strap is quite unusual, described as “webbing”. 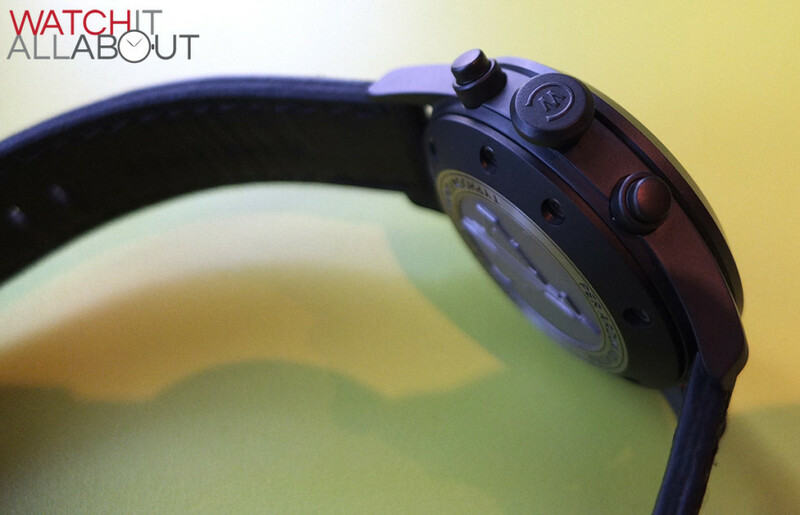 It appears to be based on the material you would find on a strap for a parachute, or a very thick NATO. Obviously this fits right in with the theme of the watch. Thankfully it’s not all webbing (it is quite rough to the touch). 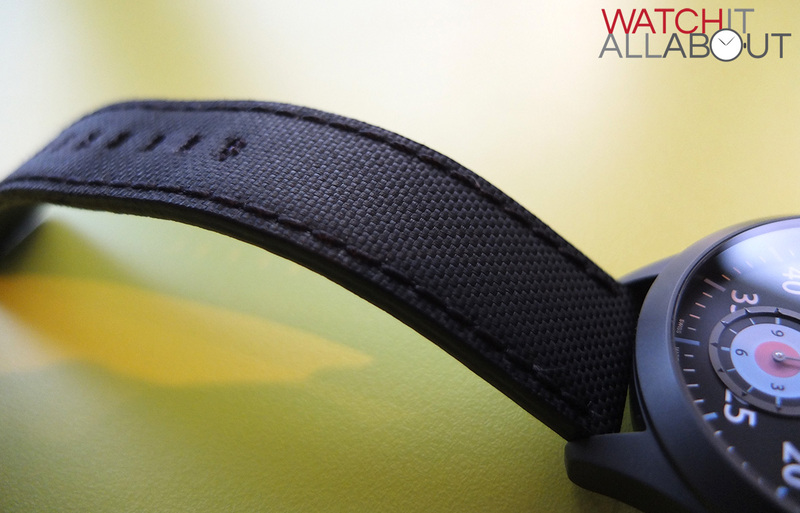 The strap has a leather underside, which is very soft to the touch, again adding to the comfortable wear. 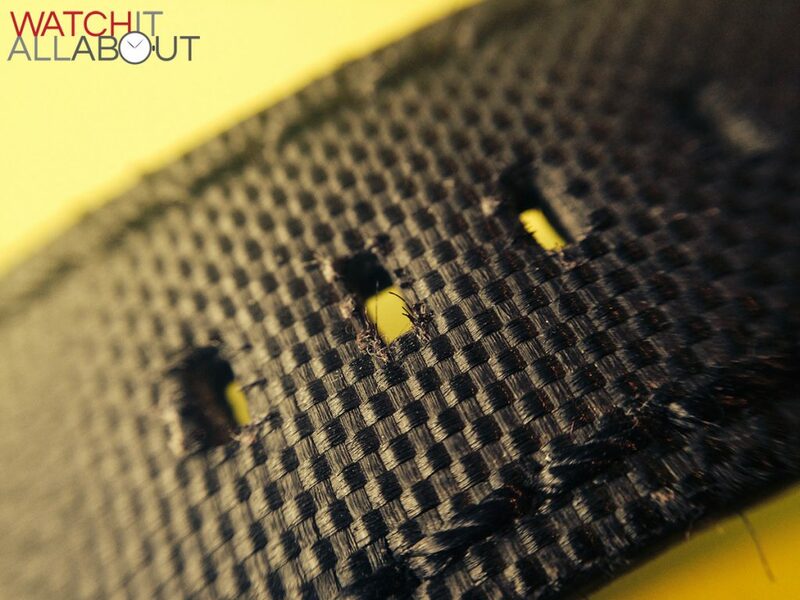 There is a thick black stealthy stitching surrounding the outer edge of the strap, all of which is impeccably stitched. The holes are wider than usual, which looks good and offers a good secure fit. 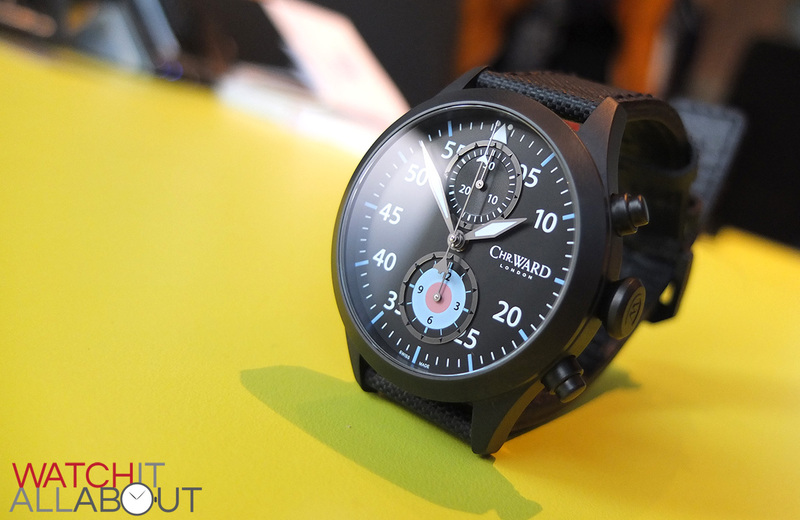 Interestingly, I usually find that Christopher Ward’s straps aren’t too good for those with smaller wrists. I am usually on the first or second hole, and I have fairly average sized wrists. The C1000 Typhoon seems to cater for those with smaller wrists better, as I find myself using the fourth hole on this strap. When you first use the strap, you will find that it is very stiff, but it does loosen in time. 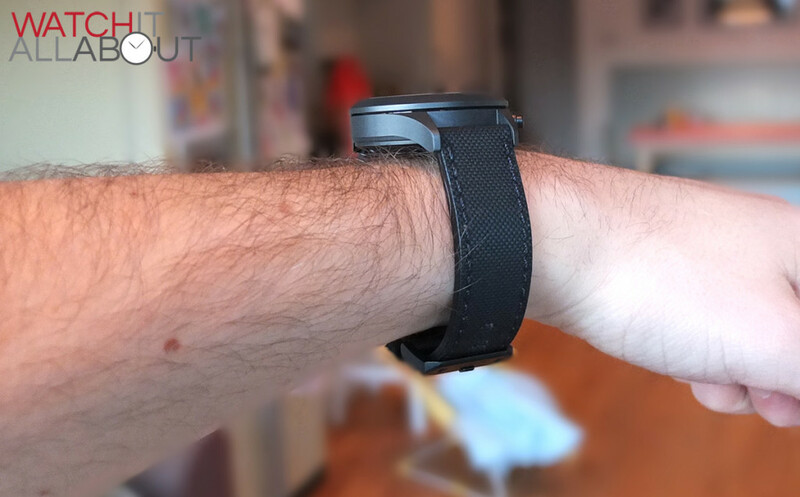 In fact, it’s so stiff you have to figure out a special way to take the watch off due to the first strap loop securing the strap so tight. I have found that I need to take the strap out of the second loop first, and then secure the case against my leg, and push the strap through the first loop from the end, which makes it loop up and out. Hard to explain, but watch the video review and you’ll see what I mean. 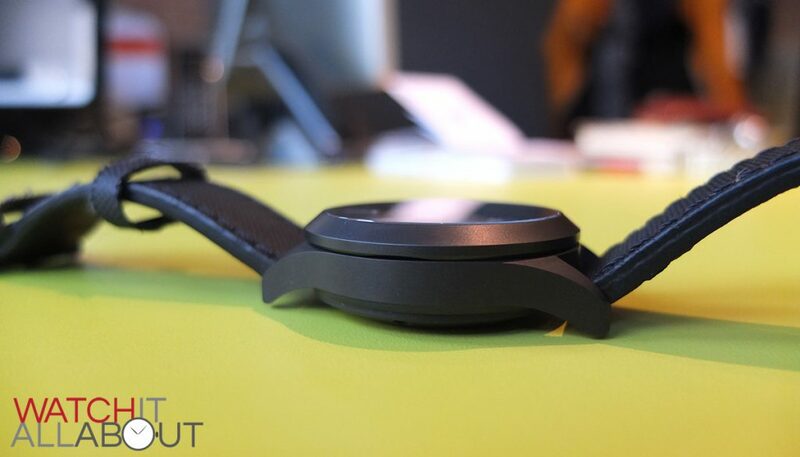 This is a bit awkward but at least it’s good to know that the strap is incredibly secure on the wrist! I’ve thing I have found is that the edges of the strap loops are real fluff and fibre magnets. If you wear a jumper, you’ll find some of the fluff caught up on out edge of the loop and you’ll have to pull it off. A bit annoying but never mind, thats the result of the fact that they are made of the webbing material rather than leather. 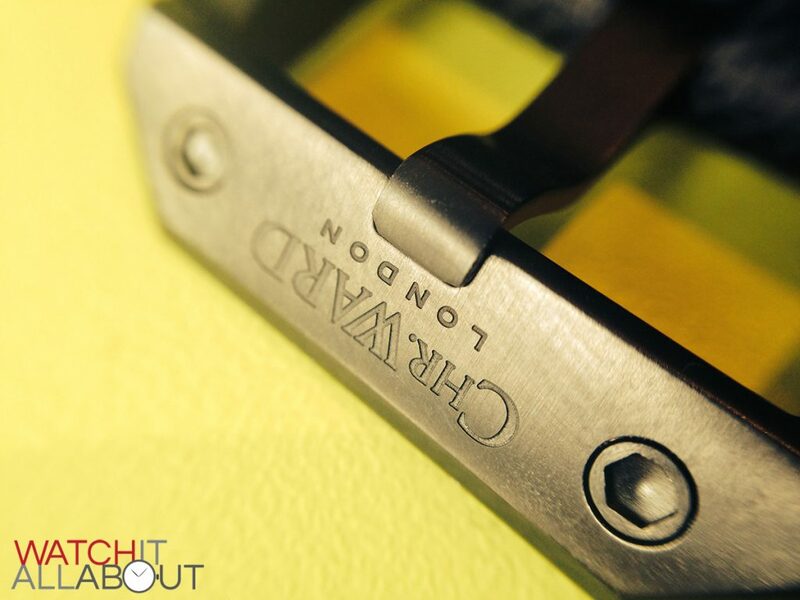 At the end of the strap is a titanium PVD coated buckle, in the style of the C11 buckle. 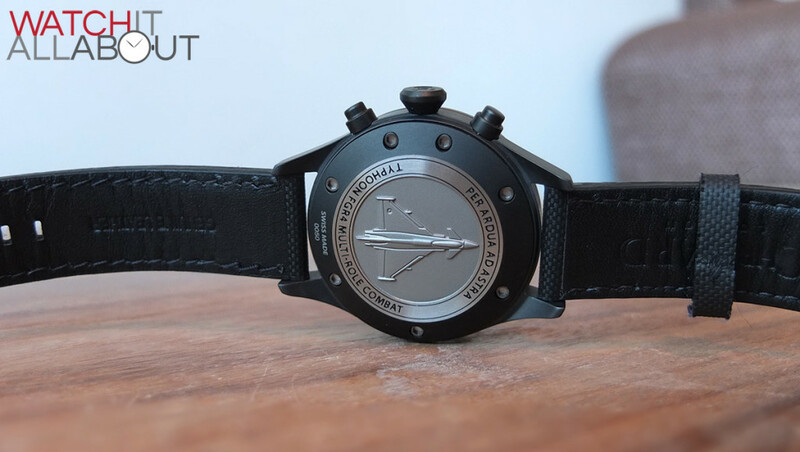 It features two hex screws and the Christopher Ward logo deeply etched into the top. All in all, the strap is very comfortable when it’s on – but due to its stiffness it can be a bit of a pain to take it off. It seems to be very tough which will stand up to the test of time. The C1000 Typhoon houses a modified ETA 7750 movement, which removes the date feature and running seconds hand, which would usually be positioned at 9 o’clock. 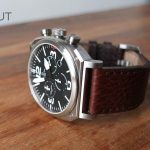 This movement is one of the easiest choices to make for a Swiss Made automatic chronograph, as it is widely regarded as being dependable and easy to modify. 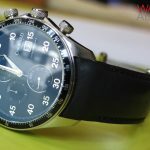 Unfortunately it is getting increasingly more difficult to get a hold of them due to the strangle-hold the Swatch group have on distributing ETA movements, which has bumped up the prices. I have found that the C1000 is very accurate straight out of the box. 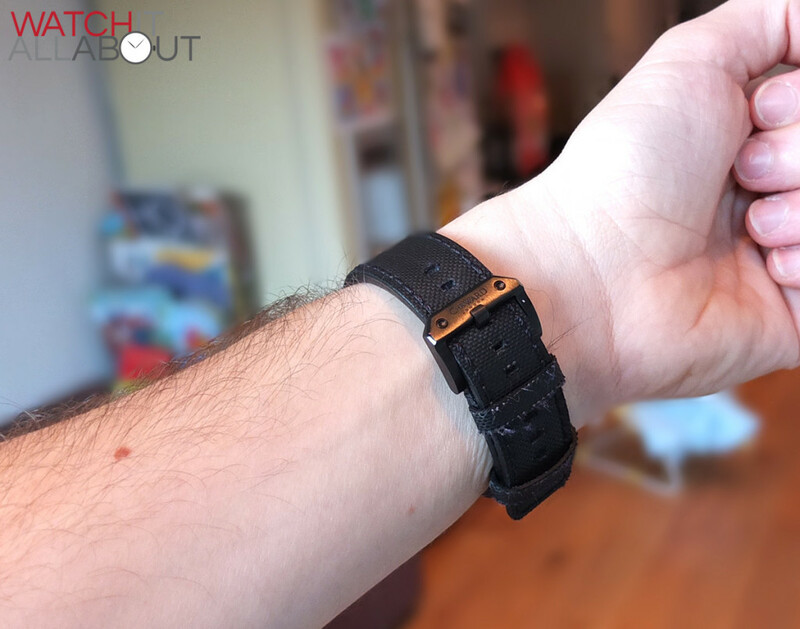 It could be due to the fact that here is no running second to judge it – but I have found that the minutes are still in alignment perfectly after a couple of weeks of wearing. The movement runs at 28.8k bph (8 ticks per second), and has around 40 hours power reserve. It winds by the rotor spinning in either direction so you can be sure that it will be quick to wind up whilst wearing. You can also handwind the watch by spinning the crown in it’s normal closed position. When you pull the crown out to hangs the time, it feels extremely solid in the hand. The only minor point is that sometimes you can hear and feel the rotor spinning around on your wrist, it sounds like it could have been lubricated a little bit more. When using the chronograph function, the pushers are extremely sturdy and reassuring when you depress them – giving a decent thud. The big seconds hand is the chronograph running seconds, and it’s motion is smooth with no wobble present. 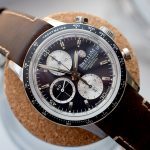 You can’t really go wrong with this movement to be honest, and you can’t get much better for an automatic chronograph unless you go for custom movements. 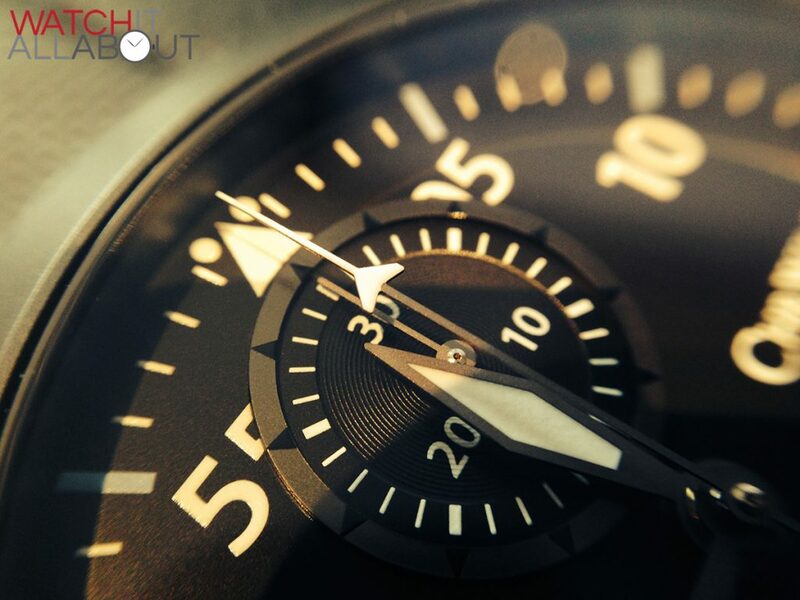 It’s used by some top watch manufacturers too – Omega, Tag, Longines, Maurice Lacroix etc. And add Christopher Ward to that list. There’s no denying that £1500 is a lot of money. 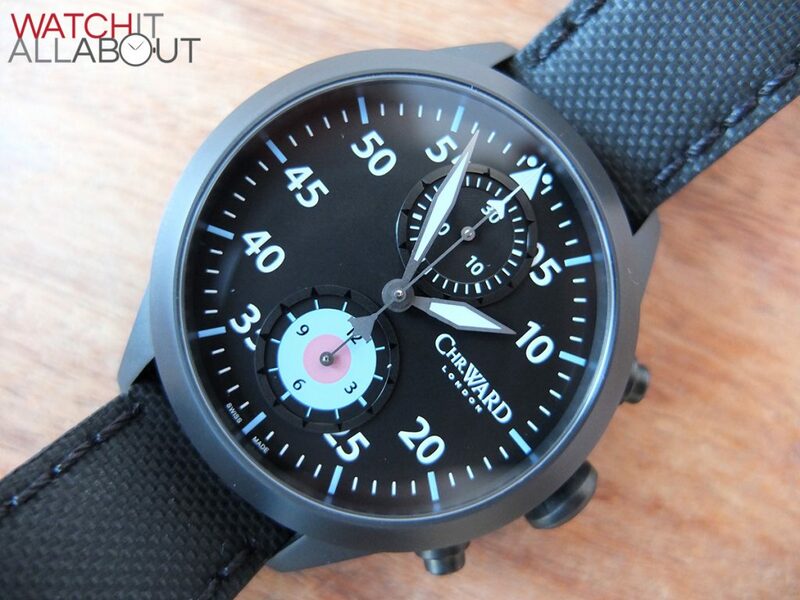 The C1000 is one of Christopher Ward’s most expensive watches, behind the Mono-Pusher and Worldtimer. But when you have it in your hand or are wearing it, it is obvious that it is worth that much; the whole feeling of the C1000 oozes high quality and is just impeccably made and refined. It is very technically advanced with a high spec, which in the end is what you pay for. The ceramic case, titanium inner frame, ultra clear crystal and modified 7750 movement still make the C1000 a well priced watch. So although I personally wouldn’t have the money to buy a C1000, if you do and like the design and inspiration it takes from the RAF and the Typhoon jet, then it will serve you well for pretty much forever. I bought this watch last December, and had it on my hand only inside my house, no labour at all. On and of when showering and sleep. After a very short time, the strap look like it has been used for years. Like you said it was very stiff and difficult put on. Do you have other persons comment your review, I will be glad to hear from you, If you want photos I can send it to you.